For a simple, inexpensive step-counting pedometer, the Sportline 340 is a good choice. It doesn't have an app or syncs your data to your computer. It simply is worn on your waistband, counts your steps, and estimates your walking distance in miles or kilometers. Some walkers prefer this design as you can reset the step count and distance total whenever you choose. If you want to track only a single walking session, you can. It doesn't automatically reset at midnight, so you can keep a longer running total if that is your choice. The Sportline 340 pedometer has an oblong shape to fit better on your waistband. It also has an advanced pendulum mechanism. But it doesn't edit out junk steps or have a sensitivity adjustment. Because of this, it may register more steps than more advanced designs. That said, it compared almost identically with a more advanced pedometer worn at the same time. You don't need to have a smartphone or computer to use it. Replaceable, long-lasting battery. No need to recharge every few days. It could be accidentally reset. It has no memory feature, so if you want to track your daily total, you will need to remember to write it down or log it elsewhere. Doesn't sync to a computer or app. 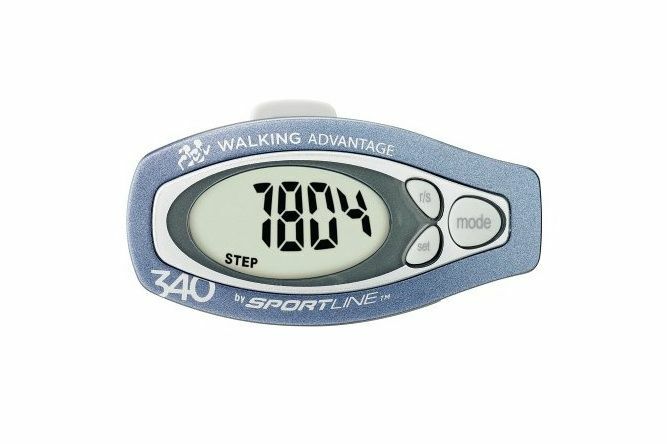 The Sportline 340 pedometer counts your steps and calculates distance. You set your stride length in order for it to calculate the distance. The Sportline 340 doesn't have a cover to protect the buttons from accidental reset, but they are recessed and it isn't easy to push them unintentionally. It has a plastic belt clip and doesn't come with a safety leash. Because it is so easy to lose a pedometer off your waistband, you should buy one or make one at home from some string and a safety pin. The sample I tried of the 340 was more likely to pop off of my waistband than the other three pedometers I wore at the same time. The operation is simple. First, find your stride length in inches or centimeters and use the Set button to change it from the default (30 inches). Now, just start walking. You can reset the step total using the reset button. You toggle between viewing steps and distance with the mode button. It counts up to 99,999 steps and 1000 miles. This pedometer uses a pendulum mechanism and you can hear it rattle a bit with each step. The mechanism has been upgraded to Sportline's advanced pedometer mechanism. I like the big number display, which is greatly appreciated by those of us with aging eyes. It is powered by a long-lasting battery that is easy and inexpensive to replace when it runs down after several months. You don't have to plug it in to recharge it every few days. The Sportline 340 pedometer has a 1-year warranty. Which Pedometer Design is Best for You?